Kodama: The Tree Spirits is a 2016 game designed by Daniel Solis and published by Indie Boards and Cards and is an abstract strategy card game where you grow a tree in order to please various spirits who end up living there. Gorgeous art, and interesting strategic choices with just enough luck to keep things interesting, this is a very enjoyable game, and once everybody knows what they’re doing, plays pretty quickly in just 30 or 40 minutes. I briefly passed by this game being demoed at GenCon 2016 but didn’t get to take much closer of a look at it. A compatriot picked it up this year at Gen Con 50 and we cracked it out just tonight for a playthrough. Right away, the visual aesthetic pulled me in. This game is gorgeous. The branches are beautiful, and at the end of the game, your twelve pieces make a really excellent tree. I wish I’d had a teal playmat to play on to fill in the sky behind the cards, that’s how pretty it is. The Kodama cards are also super cute and just seem like great little buddies to have around. The game says during each scoring phase to just discard the Kodama card you chose, but we all opted to keep them out just because we liked the look of them. The core mechanic of the game is growing your tree. Each of the three growing seasons is made up of four turns, and on each turn you take one branch card from a public supply of 4 and add it to your tree such that it grows naturally from an existing branch of the tree, doesn’t cover up any of the special features of any cards, and doesn’t touch any more than the one card it is growing onto. 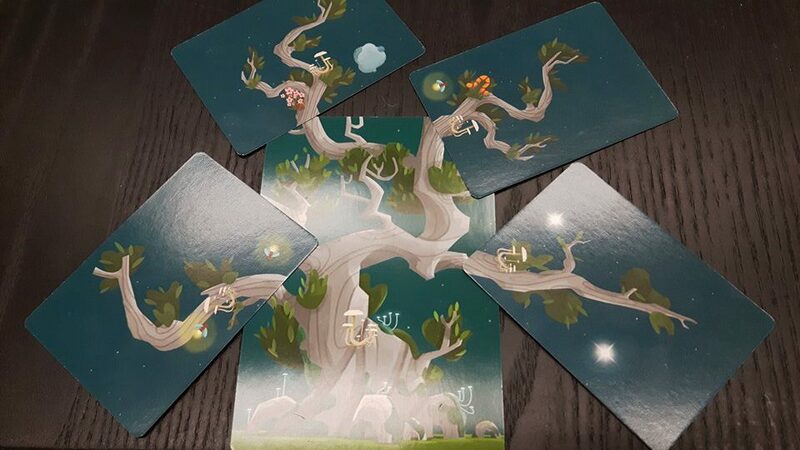 Then the card scores based on the special features on the branch (Stars, Caterpillars, Flowers, Mushrooms, Fireflies, and Clouds) cascading back towards the trunk as long as there’s at least one of that feature on each card working back to the trunk. So a card which had 1 mushroom and 1 flower added to a branch that had 1 of each, which was attached to a trunk that had only a mushroom would score 5 points. Three for the mushrooms back to the trunk and two for the flowers going back one branch. At the end of the four turns of the season, you pick one Kodama card from your hand of four (1 per season with one not ending up used) and score points based on how well your tree suits their desires. You might score points for having many cards attached to the trunk directly, or for having cards which are attached to three other cards, or for having multiple special features on end cards or base cards etc. Then you move onto the next season and repeat. Each season also has a decree card which slightly changes the mechanics for that season game by game. Just about the only thing that wasn’t absolute aces about Kodama was the Kodama card mechanic itself. There’s a -wide- swing in potential point gains depending on which cards you were randomly dealt at the start of the game. One card in particular scored you two points for each of a given feature you had out of two, whichever was fewer. Even in the third season this was only 10-14 points. In earlier rounds it was less. Compared to some of the cards I got which scored me 20 in round one and 16 in round two, a large part of our fairly wide final score differential of 124 to 86 to 80 was the fact that I had superior point opportunities from my Kodama cards. A mechanic where they could be grouped by point potential and you took one from each section, or even just a mechanic where instead of drawing four and using three, you could draw six or seven and discard all but four might help avoid that problem. Altogether this was a really fun game. 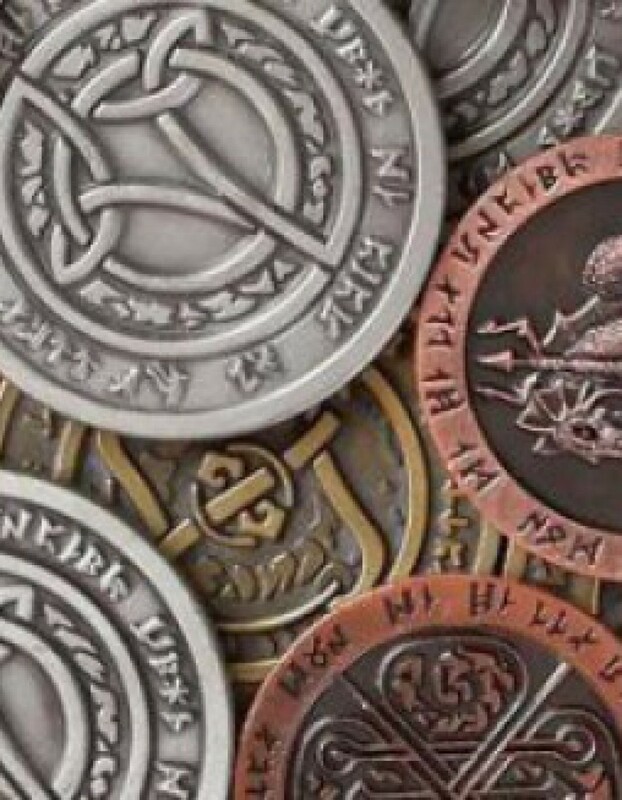 Easy to learn, fairly quick to play, comprehensible mechanics. You generally knew what your optimal play was each turn fairly easily, but being able to see all of your Kodama options right from the beginning and play them in the order you chose allows for some strategic depth in making sub-optimal plays now to increase point potential later. The drafting system of taking a card from a public set of four also allowed a little bit of trying to predict other players’ strategies and try to block them off. The nature of the scoring also means you could play the game solo and just try for maximum points as well. The box says 14+ for ages, but this feels like it could be played quite fully by younger players, and in a more simple abstracted version just as a sort of free-form puzzle even for young children, putting branches on the trees just to see how they fit together. And the visuals are so great that it would be quite enjoyable just to fiddle with the branches as an idle pastime. Had a lot of fun, and will definitely pick this up again.